Users closing monitor based alerts creates chaos in a SCOM environment. 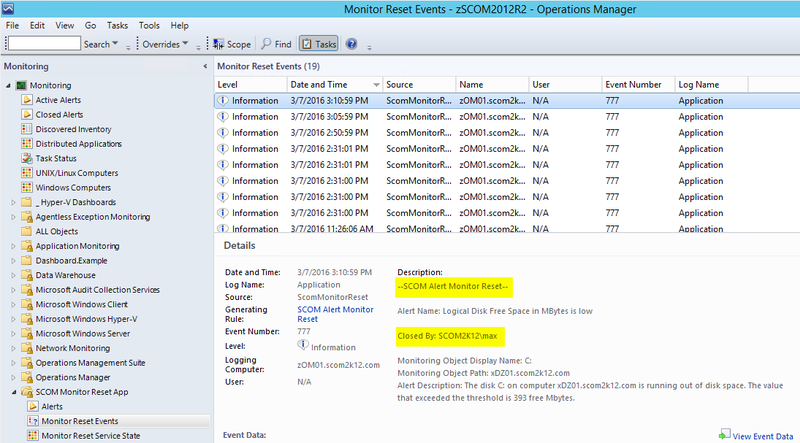 The SCOM Monitor Reset app keeps your alerts in sync. Now users can close any alert and know that if the problem still exists they will get re-alerted automatically. The SCOM Monitor Reset App is a scalable windows service that runs and resets any monitor based alerts closed by an end user. You just install it and forget it. The service takes care of all the work. Now as an SCOM administrator you no longer have to explain the difference between monitors and rules. End users can close any and all alerts. Closed alerts that are still a problem will re-open a new alert. A disk space alert comes in. The user closes the alert without fixing the issue. Normally the alert would stay closed and the monitor would remain in a critical state. But with the monitor reset app. After 5 minutes the alert is detected closed. The monitor state is reset. If disk space issue still exists a new alert will be created. Hi Tim.. I get an Event 333 – String was not recognized as a valid DateTime. When App catch up on closed alerts,, I have looked in RegDB, and my SDK account setting is in my case da-DK, sDate string value is with “-“. I have tried in test just change to “/” to work out if this have something to do with formatbut with no luck. Can you help out here, would love to use this feature 🙂 Regards. I am not able to delete the events created in “Monitor Reset Events”. For how many days these events will be in the view. And is there any way we can pull the reports for the same to know who manually closed alerts and when. Do you have to purchase the Reset App? or Free tool? Is this a paid app? I noticed the application trial ended. There is a small fee. This will keep the product up to date as free products get outdated and there is no motivation to update the product. You can purchase a license here.